Of the many Bible translations available today, are some better than others? If so, what criteria can we use to determine what makes a good translation? Leland Ryken introduces readers to the central issues in this debate and presents several reasons why essentially literal-word-for-word-translations are superior to dynamic equivalent-thought-for-thought-translations. You don’t have to be a Bible scholar to recognize the need for a quality Bible translation. We all want to know that the Bible we read, study, and memorize is faithful to the original. 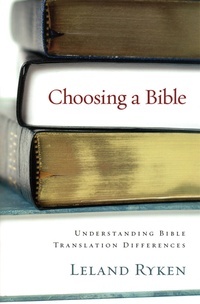 Dr. Ryken tackles this issue and breaks it down in this concise, logical, and straightforward book, giving readers a valuable tool for selecting a Bible translation.